When catastrophe strikes, you’ll want the right assistance quickly. Business.org explains the qualification and application process for an SBA disaster loan. When it comes to SBA loans, to paraphrase The Facts of Life, you take the good . . . you take the not-so-good. On the upside, SBA loans—loans guaranteed by the Small Business Administration through approved lenders—come with low interest rates and long repayment terms. On the downside, they’re not always easy to get, and you’ll have to deal, at least tangentially, with the federal government. You’ll also have to first face rejection for a regular bank loan and prove just how “small” your business is. Still, tens of thousands of SBA loans are given to small-business owners every year. Let Business.org guide you through how to become one of these lucky loan recipients. Rates listed above do not represent the typical amount for every borrower, and other fees may apply. Get rejected for a standard loan. Before you apply for an SBA business loan, you first need to show that you’ve been turned down for a regular loan. The SBA doesn’t technically use the term “last resort,” but you’ll have to go through the private-financing rejection process first before they’ll consider you. Fit the definition of a “small” business. Depending on your type of industry, the SBA will determine the “smallness” of your business either by annual revenue receipts or number of employees. For the latter, your total count of full-time, part-time, and temp workers must be under 500. Meet loan-specific requirements. There are several categories of SBA loans, which come with several sets of unique qualifications (though a baseline credit score of at least 680 factors in consistently). Unlike most loans from traditional lenders, SBA loans have specific uses, and each loan comes with different requirements. Maintaining a good credit score. As we’ve mentioned before, a personal FICO credit score of 680 or above is the minimum to be considered for an SBA loan. As with any kind of loan program, SBA or otherwise, the higher your personal credit score, the better your chances. Planning for the future. A new small business won’t have many years under its belt to demonstrate stability—but it can have a plan going forward. Mapping out a strong, executable strategy for future growth can make your startup look nearly as secure as a long-established business to lenders. Running a profitable business. Banks tend to lend money to businesses that are making money—even if it doesn’t make sense on your end, it does on theirs. Even with SBA backing, banks are averse to risk. Lenders look at your bottom line, and they also take into account how you’re managing your cash day to day. Having collateral on hand. It may not be something you want to think about, but what do you own that could cover the loan in case of default? Real estate, buildings, vehicles, equipment, inventory, accounts receivable—they’re all considered valuable collateral to banks and lenders. Knowing your industry. Is your type of business on a growth trajectory, or is the forecast bleak? Now isn’t the best time to launch a newspaper or an iPod repair kiosk, but the outlook for other kinds of businesses isn’t always as immediately obvious. Do your homework on the industry landscape before you jump in. A complete list of SBA-approved lenders in your area can also be found at SBA.gov. Since you’ve read this far, you now have a pretty good idea of how to apply and qualify for an SBA loan to further your business plan. 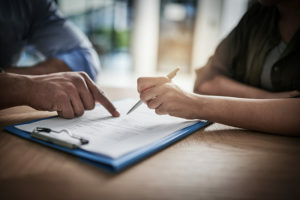 As with any loan for business owners, there are plenty of considerations and paperwork to slog through; unlike standard lenders, the SBA loan program offers low interest rates and long repayments terms that can justify the wait (and you will be waiting, even with the “expedited” options). For further information on types of SBA loans, SBA loan rates, and SBA disaster loans, click around Business.org.